I spent an afternoon pulling weeds between freshly planted cauliflower seedlings struggling to take root. With enthusiasm only a farm volunteer wanting to learn more about vegetables could have for weeding, I dug my fingers in deep, ensuring all cauliflower competitors were rendered lifeless. Or so I thought. The next week I was re-assigned to the cauliflower field. Purslane and Pigweed had sprung up as if spontaneously generated, all signs of enthusiastic weeding vanished. Farmer Kris said the seedlings hadn’t taken off as she’d hoped. I have to admit, my first thought was – no big loss, I don’t really like cauliflower all that much. But Zenger Farm has rows and rows planted. Somebody must like it. And losing their crop means losing a piece of their livelihood. The little seedlings needed me. In between weeding, massaging fertilizer into the dirt, and whispering encouraging words to the fledgling plants, my mind wandered. Purslane and Pigweed, yes, they’re weeds, but edible weeds. And so many of them. Why don’t we just scrap the cauliflower and harvest the weeds? I mean, who likes cauliflower anyway? It’s always the last vegetable on the veggie tray. Even slathered in ranch dressing it hardly qualifies as food. The weeds don’t need cultivation, irrigation, fertilization and weeding. Have dirt, will travel. But then I snapped out of it. I was given a task, and I wasn't going to let those weeds get the best of me, again. Besides, another farm might spray an herbicide to control the weeds. Not at Zenger Farm, where they aspire to be ‘beyond organic.’ That means not just using all organic products on the farm to keep plants healthy, but treating the farm as a system by maintaining the health of the soil through natural cycles. Like planting clover that’s rich in nitrogen as cover crops, letting chickens turn the soil while they eat it, all the while depositing their nutrient-rich manure. This eliminates much of the need for using 'off-farm' products. I made my weekly trip to the Hillsdale Farmer’s Market a few days later. Guess what I found. 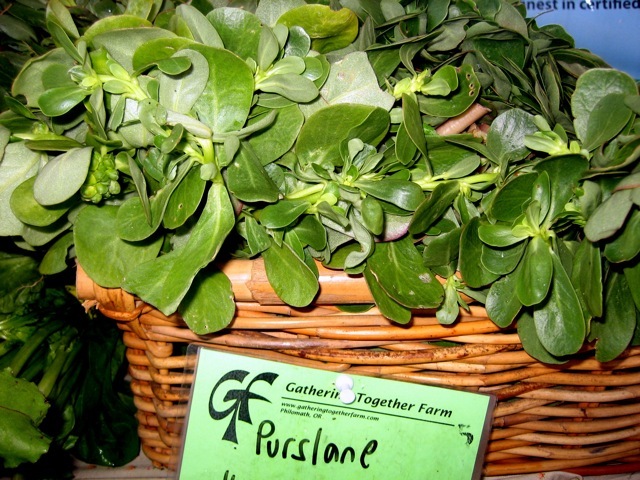 Purslane! One farm's nemesis another farm’s cash crop. (Although Gathering Together Farm planted it on purpose, using a cultivated variety.) I’d nibbled the weed version out in the fields, but this I had to take home with me. I added it to a garden salad, served seared albacore tuna on a bed of it, mixed it in with egg salad and I still have some left over that I’m trying to figure out what to do with. It has a tangy taste, citrus-like almost, the leaves thick and weighty. Tasty! I thought about steaming or sautéing it, but everything I’ve read includes a warning that if you don’t like slimy, mucilaginous foods, you may not want to cook this weed/vegetable. Maybe I’ll try it just to see what happens. If you have even a small patch of yard, and you’re brave, you can probably find this weed on your own. For an identification guide, click here. As with most weeds, beware of the evil twin (looks just like it, but moderately toxic.) If you live in Portland, take a class with Wild Food Adventures for all things forageable. As for the cauliflower, it won’t be ready until winter. I have some time to think about giving it a second look.